Built for performance and show, the Typhoon® Air Intake System is a free-flowing mandrel-bent aluminum tube induction system designed to fit many sport compact performance vehicles. Each kit is proven on a rear-wheel dynamometer to increase horsepower and torque. Typhoon intakes come in one of three designs; cold air intakes (CA), short ram intakes (SR), or complete cold air (CCA) intakes which can be configured as either a cold air intake or a short ram intake. They come with an oversized High-Flow conical air filter designed to provide increased surface area and dust capacity. This extra surface area provides even more airflow at lower restriction than a standard K&N O/E replacement filter that is limited to the size of the factory air box. The oversize air filter also captures more dirt increasing the service life before a cleaning is required (up to 100,000 miles). Unique, reinforced, silicone hoses for increased durability, tensile strength, and a high temperature range. Powdercoated, steel brackets used where high engine torque can cause increased stress on the intake system. Silicone, rubber, vibration mounts are used to absorb stress and movement caused by engine torque. CNC Mandrel-bent aluminum tubing for smooth straightened airflow. Available in high quality finishes for customization. 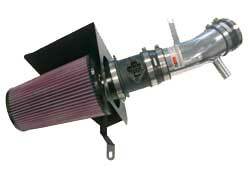 Drychargers are included in some Cold-Air intake systems. Provides added protection by repelling water from entering the intake tract.